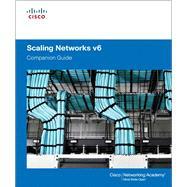 Scaling Networks v6 Companion Guide is the official supplemental textbook for the Scaling Networks v6 course in the Cisco Networking Academy CCNA Routing and Switching curriculum. · Chapter objectives–Review core concepts by answering the focus questions listed at the beginning of each chapter. · Key terms–Refer to the lists of networking vocabulary introduced and highlighted in context in each chapter. · Glossary–Consult the comprehensive Glossary with more than 250 terms. · Summary of Activities and Labs–Maximize your study time with this complete list of all associated practice exercises at the end of each chapter. · Check Your Understanding–Evaluate your readiness with the end-of-chapter questions that match the style of questions you see in the online course quizzes. The answer key explains each answer. Interactive Activities–Reinforce your understanding of topics with dozens of exercises from the online course identified throughout the book with this icon. Packet Tracer Activities–Explore and visualize networking concepts using Packet Tracer exercises interspersed throughout the chapters and provided in the accompanying Labs & Study Guide book. Hands-on Labs–Work through all the course labs and additional Class Activities that are included in the course and published in the separate Labs & Study Guide.